We came across a story by a guy named Eric. 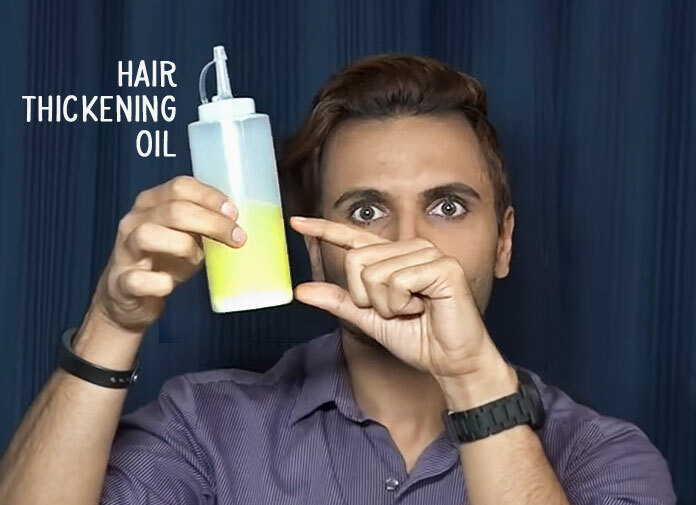 He talks about DIY hair thickening oil that he uses daily for thicker and longer hair growth. He claims that using this oil mixture works, because the oils in the recipe have properties of nourishing the scalp, increasing blood circulation, and giving essential nutrition to your hair follicles. In addition, there’s no denying that his hair also looks amazingly lustrous! There’s no end to this, but he mentions that he applied this thickening oil mix for several months and it has made his hair much thicker. He only used it 2-3 times a week. He also says that his oil mix also has additional benefits of making his hair grow quickly. He talks about how he regrew hair back in a different episode, which we share in detail here.